Natalie Geisenberger clinched her seventh consecutive World Cup women's luge overall championship Saturday, winning the final full-length race of the season to secure the points crown. Felix Loch is the world men's luge champion for the record-tying sixth time, after the German great edged Reinhard Egger of Austria by one-tenth of a second on Sunday for this year's title. 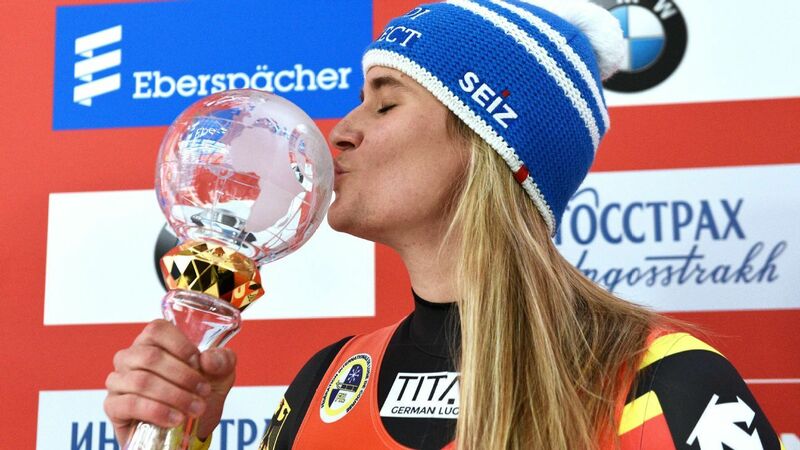 Natalie Geisenberger won the luge world championship for the fourth time Saturday, giving her nine world titles overall. Latvia won a World Cup luge gold medal for the first time Sunday, prevailing in the team relay. The United States took third behind Germany and Austria in the World Cup team relay, giving American Summer Britcher four medals for the season and two this weekend. Chris Mazdzer teamed with Jayson Terdiman for a silver medal in the World Cup luge doubles sprint race Sunday, one of two medals won by the Americans at Mount Van Hoevenberg. Matt Mortensen, a two-time Olympian in doubles luge and a five-time national champion, announced his retirement from sliding Wednesday after a career that spanned 20 years. Bill Tavares, who has helped the United States win sliding medals in every Winter Olympics since 2002, will stay on as coach through the 2022 Beijing Games. Sunday's highlights in Pyeongchang include Gus Kenworthy's run for his first Olympic gold in men's ski slopestyle and Austrian alpine skier Marcel Hirscher's quest for gold in giant slalom. Saturday's highlights in Pyeongchang include Nathan Chen, who hopes to rebound from a disastrous short program, while Lindsey Vonn makes her Pyeongchang debut in super-G.
Thursday's highlights in Pyeongchang include USA's Mikaela Shiffrin, who will go for her second straight slalom gold, while the U.S. men's hockey team will look to shake off their rocky start. Germany has capped the luge portion of the Pyeongchang Olympics in style, winning gold in the team relay; it was a history-making win for Natalie Geisenberger, who now has five Olympic medals. Thursday's highlights in Pyeongchang: The U.S. women's hockey team will look to keep its winning streak going against Canada, while Germany will eye a second straight mixed team relay luge gold. The German team of Tobias Wendl and Tobias Arlt, who have been dubbed "the Tobys," won the gold medal on Wednesday in men's doubles luge. Wednesday's highlights in Pyeongchang: America's 22-year-old skiing star will look to win her second Olympic gold, and a snowboarding icon takes to the skies seeking redemption. Natalie Geisenberger refuses to call herself the best women's luge athlete ever. Tuesday's highlights in Pyeongchang: America's 17-year-old snowboard star will look to win her first Olympic gold, and Maame Biney tries to reach the women's 500-meter final for Team USA. Shiva Keshavan, taking part in his sixth and last Olympics, finished 34th in the men's luge singles event at the Pyeongchang Winter Olympics. It was luge legend Felix Loch's race to win. But an unlikely trio, including American Chris Mazdzer, made their own history in the Olympic men's singles final. Mazdzer wins men's luge singles silver for U.S.
Chris Mazdzer has given USA Luge its first men's singles medal in history, and the reign of Germany's Felix Loch as Olympic champion came to a sudden and shocking end with David Gleirscher claiming the gold.